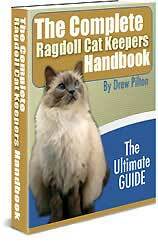 The Ragdoll is a short-legged, semi-longhaired cat, with Siamese-like points marking its thick coat. Its rabbit-like fur gives it the lush, long-haired look of Persian cats, but does not mat as much and requires less grooming and maintenance. Some Ragdolls may have markings on their face and feet. Typical Ragdolls have medium-sized, muscular bodies, a broad, flat-topped head, and medium-sized ears angled slightly to the front. The eyes are obliquely set and usually a deep blue. Both the eyes and ears are set wide apart. The tail is bushy, slightly tapered, and should reach the cat's shoulder when placed along the side. The paws are rounded with long tufts. Ragdolls are all white at birth, developing colors at about 10 days old, but showing full color and pattern only after two to three years. There are four colors and three patterns accepted in most breed associations. Ragdolls are described by combining their colors and patterns, such as "seal colorpoint" or "chocolate bi-color". Seal Ragdolls have light tan bodies with dark seal brown points. The shade can range from ivory to pale beige, and usually lightens at the belly and chest area. The nose leather and paw pads should be seal brown to brownish black, and may have rose-colored undertones. Chocolate colored Ragdolls have ivory bodies that also lighten at the belly and chest. The points range from warm milk to bittersweet chocolate with rosy undertones. The nose leather is usually rose-brown, and the paw pads are brownish salmon pink. Blue Ragdolls appear cold, with bluish white to platinum grey fur and no tinge of brown. The points are blue-grey to deep slate, and the nose leather and paw pads are dark blue with pink undertones. Lilac cats are magnolia white with pink to lavender paw pads. The points are pale dove-grey to warm lavender, with the flesh color visible through the fur. Fur color is warm to creamy white, with deep orange points and pink paw pads and nose leather. The body is creamy white and appears a dull beige or buff overall. The paw pads and nose leather are pink, and the points are pale sand or dark cream. Colorpoint cats are darker at the points compared to the rest of the body. The point color is usually the same as the paw pads and nose leather. They have no white markings, although some pale-haired Ragdolls may appear white. Mitted Ragdolls also have dark points, but also have white fur on the paws, rear legs, chin, ruff, and stomach. The paw markings are called "mitts", while the rear legs are called "boots". Bi-color Ragdolls have an inverted V-shaped marking between the eyes, which expands over the muzzle. The cat is also dark at the points, with a saddle-like strip on the back and white fur on the rest of the body. The paw pads and nose leather are usually pink. The Lynx pattern features tabby markings on the face in rough W-shapes. The markings can show over other patterns. The Tortie point also overlays other patterns. Tortie point cats have red or cream points mixed with any other fur color. Click Here To Download Your Copy Of The Handbook!